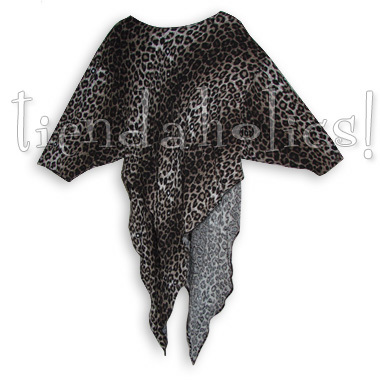 Color(s) Shown: leopard cat animal print only! IT'S RARE THAT WE GET THIS SPECIAL PRINTED FABRIC IN STOCK... SO WHEN IT'S GONE, IT'S GONE! This tunic is simply the wildest! The shape is jungle magic with its lo-o-o-o-ng pointed asymmetrical hemline... designed by Laise Adzer and made exclusively by Dairi! It's similar to but LONGER than the Tienda Ho Asabi (BJ27), and it's more accommodating across the bustline, too! See more about this scrumptious style, including measurements, on its regular page, here. This Nawari is earthy and wild in naturalistic leopard print (usually a long wait special order fabric) purrfect for cat lovers! The two-layer style is all kinds of crazy as it is... but in jungle cat spots it's pure tribal magic! It's elegant and wild—you're elegant and wild... a perfect match! Be grr-gorgeous every day... WHY NOT?